The Pride Outside the Village walking tour listens to historical tales on the final stop. Photo by Scott Dagostino. Flanked by a Shoppers Drug Mart and a Starbucks, the corner of King and Yonge doesn’t seem like a pivotal spot for the LGBTQ community in Toronto. 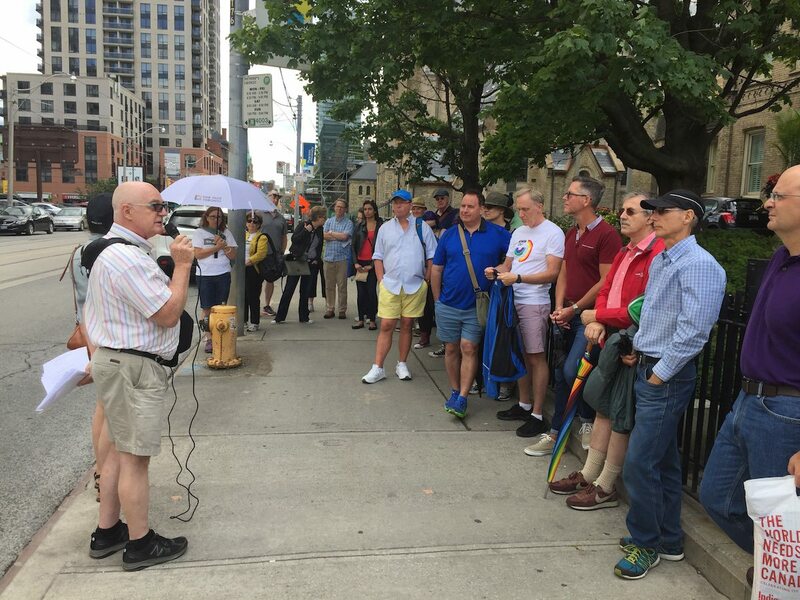 It’s many blocks away from the Church and Wellesley neighbourhood that’s been its hub for decades now, but on a breezy Saturday afternoon earlier this month, it’s the meeting spot for a walking tour designed to show that downtown Toronto has been a very queer place long before there was a Village. 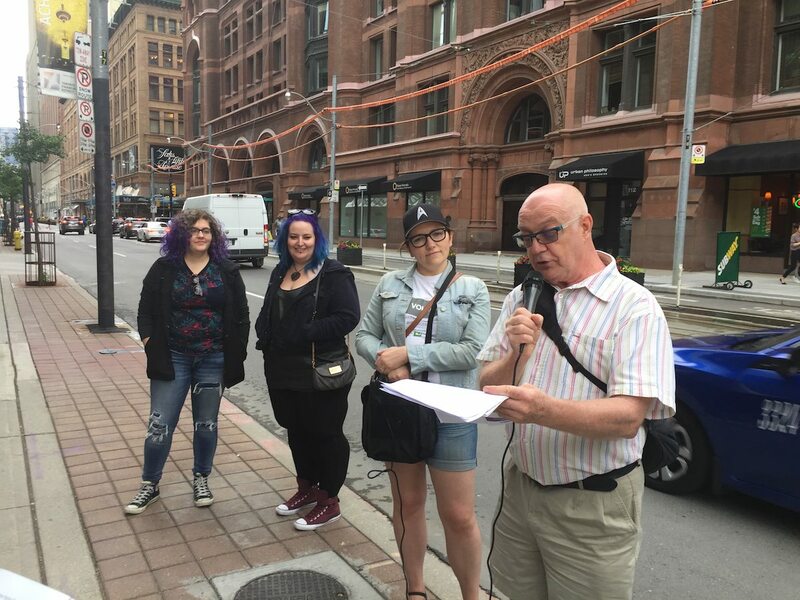 Activist and former teacher Dennis Findlay is the board president of the Canadian Lesbian and Gay Archives, which has teamed up with Heritage Toronto for these tours. As a group of about 25 men and woman gather on the corner, Findlay flips through his sheets of prepared notes. Findlay co-ordinated the Legal Defence Committee of the Right to Privacy Committee as a response to the police raids on gay bathhouses in 1981. He not only knows his history, he’s a vital part of it. 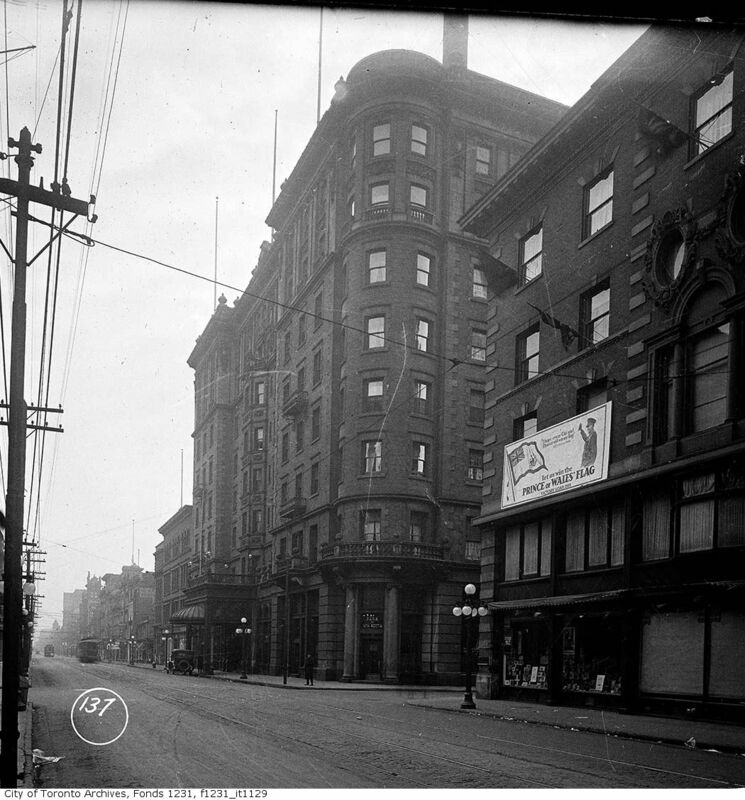 The King Edward Hotel in 1919. Photo from the City of Toronto Archives Fonds 1231, Item 1129. 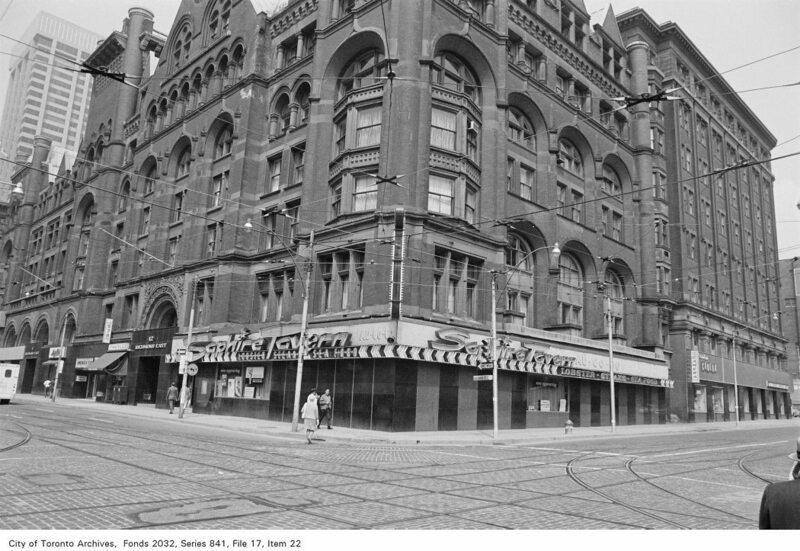 Findlay leads the group eastward to the King Edward Hotel, Toronto’s first luxury hotel. It was opened in 1903 but it was around the middle of the century that the hotel quietly but actively encouraged a gay clientele at its bar, Findlay explains. These dapper gentlemen had money and good manners, a winning combo, until their gay head bartender was poached by the smaller hotel down the street. Dennis Findlay leads the Pride Outside the Village tour. Photo by Scott Dagostino. Bain notes that Heritage Toronto is “really looking to continue to diversify our programming and start speaking about all the different communities in Toronto. Heritage isn’t just about the past, it’s about building an compassionate future that’s inclusive … it’s not that George Brown wasn’t a fantastic guy, but his is certainly not the only story of Toronto,” she laughs. At the final stop at 201 Church, just south of Dundas, Findlay discusses the former Community Homophile Association of Toronto and he and the organizers receive a round of applause from the crowd. The tour lasted an hour and a half. The next tour takes place August 24 at 6:30 p.m. at King and Yonge streets (northwest corner). It’s $20 for general public, $14 for members; registration required.